Projecting wall hydrant is furnished complete with male outlets, caps and chains, 4" or 6" inlet with two 2 1/2" male outlets. 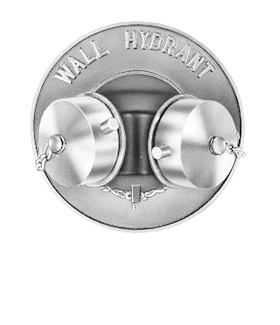 Escutcheon plate is lettered "Wall Hydrant". Finish: cast brass. Optional: polished brass and chrome plated.